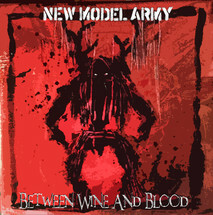 Thirty years on from their debut, the prospect of six new tracks from New Model Army won’t set many pulses racing, but Between Wine And Blood shows that Justin Sullivan and co are far from a spent force. If, like me, you zoned out long ago, you might even wonder what you’ve been missing. This album is a companion piece to last year’s Between Dog And Wolf, part new material, part live document of the accompanying tour. Sullivan’s voice retains its honest-to-goodness earthiness and has lost none of its gravity, while the music still provides solid support for lyrics of almost ridiculous portentousness. (‘I live on an angry planet amidst the crowds and the endless noise / in the debris of the broken families and the cracks in the grand designs’). The overall feel is less constricted than of old, though. The Army’s hallmark earnestness seems to be gradually loosening its stranglehold on their music. There’s something of Queens of the Stone Age’s easy going style about ‘According To You’s strutting melody and muscular guitar chops. ‘Happy To Be Here’ is Nick Cave in atmosphere, right down to the thunderstorm sound effects, even if it lacks some of Cave’s intricacy, while ‘Devil’s Bargain’ offers primal rhythms and soaring strings. This melodic adventurousness is all relative of course. It still comes bundled with some stony-faced chug-along rock of the old school. The accompanying live album is completest only stuff, but again shows there is life in this old dog yet. The performances have remarkable power and intensity, and given that these cuts are all newish material, there’s no sense of an act trying to trade on former glories. You certainly wouldn’t be kicking them off the stage if they came to a gig venue or festival near you. Between Wine And Blood is a happy reminder of the gutsy, well-rooted alternative rock of the 80s. Bradford’s finest are definitely getting taken off the has-beens list.